If you looked at electric guitars through the lens of genealogy, the Stratocaster and Telecaster would seem like brothers born three years apart. Together, they carry the coat-of-arms of the family Fender: single-coil pop, bright articulation, and endless versatility. At the same time, Strats and Teles are different in some significant ways. These differences have led to divergent histories, player endorsements, lore and fan bases. Whether you're looking to buy or wondering which guitar would be best to record that particular sound you've been hearing in your head for weeks, here's a primer. Before you start arguing that some Teles have Bigsbys or extra pickups or that some Strats have hardtail bridges, keep in mind that the table above shows the high-level comparison between the current Fender American Standard offerings for both models. The same finishes are usually available for both, and the body wood has been interchangeable (there have been plenty of ash-bodied Strats and alder Teles through the years). For the sake of consistency, I'll reference what players consider the classic specs for each. There are some superficial differences: body shape and a neck pocket geometry (square on Teles, rounded on Strats). But what are the real characteristics that polarize people around these two models? When the Strat debuted in 1954, players weren't sure what to make of it. The Fender Telecaster and Gibson Les Paul had just come out a few years prior. People were still trying to figure out exactly where solidbody electric guitars fit into the picture. And here comes the Strat, eagerly showing players the virtues of extra pickups and a crazy lever for detuning before they knew they wanted it. Its body shape, three single-coil pickups, and futuristic vibrato bridge - now an endlessly copied template, a universal shorthand for electric guitar - were completely new concepts. Not just "Parker Fly" new, not just a postmodern reimagining. Paradigm-shifting new. But it would take a few artists, who were revolutionary themselves, to turn people on to this new paradigm. A neck pickup tone like no other. Glassy, round, bell-like. Use your adjective of choice. The 2 and 4 positions on the 5-way selector, sometimes called the quack tones. When the selector had only 3 positions in earlier years, players would stick the switch in these sweet spots. Listen to Mark Knopfler milk these in the video example below. A vibrato bar (trem arm) with more give than a Bigsby. Players can keep it in their hand to articulate in real-time (watch latter-day Jeff Beck at work). The players above are responsible for the sales of millions of Stratocasters. They played in ways that leveraged the unique character of the Strat and made that a part of their sound. But there are other players who have built careers playing one in less obvious ways. Billy Corgan played a Strat with with tons of gain and fuzz (his signature model had DiMarzio humbuckers) for most of the earlier Smashing Pumpkins years. Yngwie Malmsteen shreds a Strat to this day, albeit with plenty of gain and scalloped frets. Even Ritchie Blackmore put one to good use: "Smoke on the Water," that iconic heavy riff, was played with a '68 Stratocaster. It is this double-life that has made the Strat so enduring. On one hand, you have a very defined, iconic character (see calling cards above). On the other, a chameleon. 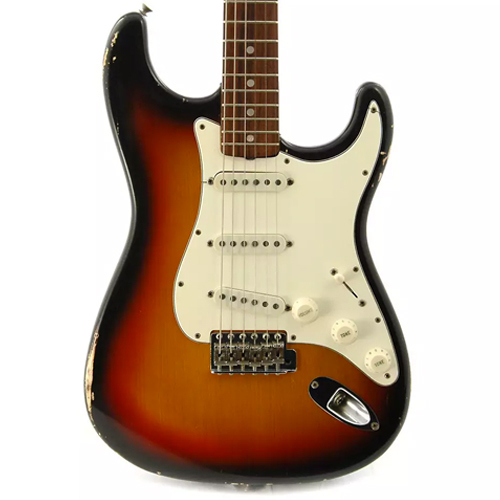 The model has led to countless "Super Strat" iterations that fueled hair metal in the '80s and plenty of "partcasters" with odd pickup combinations. There are some things the Strat struggles to pull off: the true depth and meat native to PAF-type humbuckers and the bridge pickup twang native to Telecasters. But the things it does well - the neck pickup cleans, the quack tones - no other guitar can touch. 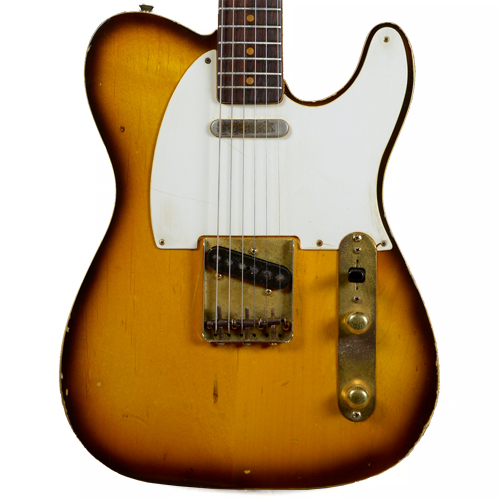 Paul Bigsby may have built some visionary prototypes in the late 1940s, but Leo Fender's Telecaster (initially called the Broadcaster) was the first solidbody electric guitar to see mass production and widespread use. To this day, it is still one of the most popular electric guitars (and most searched terms on Reverb). Something has to be behind this enduring obsession. A bridge pickup tone like no other. The definition of twang when clean. The definition of rock when dirty. Liberating simplicity. Two pickups, two knobs, six strings, no frills. It forces you to be a better player. Surprising versatility. Across three pickup positions, different tone knob positions and varying levels of gain, the Tele is capable of an unexpected number of voices. Creating a list like the one above is almost a fool's errand - there are too many famous players to name (what about Phil Baugh?!) who have embraced the Tele throughout the years. The Telecaster is unavoidable, ubiquitous, a solid choice for playing nearly any kind of music. The musicians named here either built their careers playing one or pioneered some of its hidden talents. The archetypal sounds of country - bright twang, double stops, chicken pickin' - will forever be married to the Tele. But the model has been used by trailblazing artists in nearly every genre. Rock took form with Tele-fueled riffs from Keith Richards and Jimmy Page, among others. Electric blues was shaped by Telecasters in the hands of Muddy Waters, Albert Collins and Roy Buchanan. Jazz found champions in Bill Frisell, Julian Lage, Robben Ford, and (occasionally) John Scofield. The Tele even shows up in metal in the hands of John 5 and Jim Root. And let's not forget players like Joe Strummer and Prince, very different guitarists, both drawn to the virtues of the Tele. Perhaps at the end of the day, the Tele's strength is its unassuming simplicity, its place as the protean ground zero for all other solidbody electric guitars. It can become anything you want. Hundreds of iterations over the years - thinline, humbuckers, Nashville setup, B-bender, Bigsbys, etc. - prove as much. But strength alone doesn't win hearts. The Tele planted its flag at the starting line of amplified American music. Those early sounds of twang, bite and snap are still what define its legacy and earn our ongoing love.